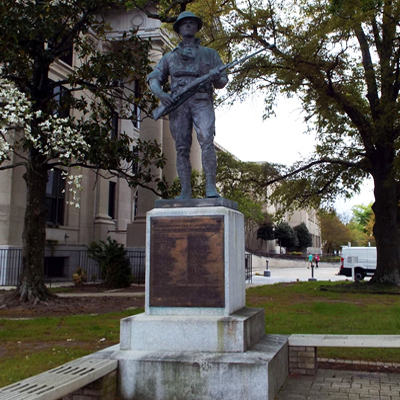 The statue is a slightly larger than life-size figure of a World War One Doughboy. He is looking straight ahead holding a rifle with bayonet attached. He is wearing a helmet, an ammunition belt with canteen and bayonet scabbard around his waist and a gas mask bag around his neck, resting on his chest. This statue, of which other examples were produced by the sculptor Theo Alice Ruggles Kitson, was titled “On Guard.” The statue is supported by a granite plinth on a double base. A large but simple bronze plaque fills the front of the plinth with a smaller one on the left side when facing the statue. The statue stands at the street corner on a brick patio. Rain forced the ceremony into the courthouse which only held a third of those who came to witness the activities. Professor Albert Coats a Johnson County native and a member of the law faculty at the University of North Carolina provided the dedication speech. The Armistice Day speech was delivered by Congressman John H. Kerr. Despite the rain the day featured a parade and fireworks during the evening. A barbecue dinner was served at the Armory. In 1895 Theo A. R. Kitson became the first woman admitted to National Sculpture Society. She specialized in robust war memorials and became one of the leading sculptors of war memorials in the United States. She is best known for “The Hiker” a monument commemorating turn of the 20 th century American conflicts, the Spanish-American War, Philippine-American War and the Boxer Rebellion. About 50 versions of this work appear across the United States. Between 1902 and 1920 she produced more than 60 statues, busts and reliefs at the Vicksburg National Military Park in Mississippi. The statue is located at the corner of E. Market and S. 2nd Streets in Smithfield, NC. It stands on the front lawn, to the right of the main entrance to the Johnston County courthouse. 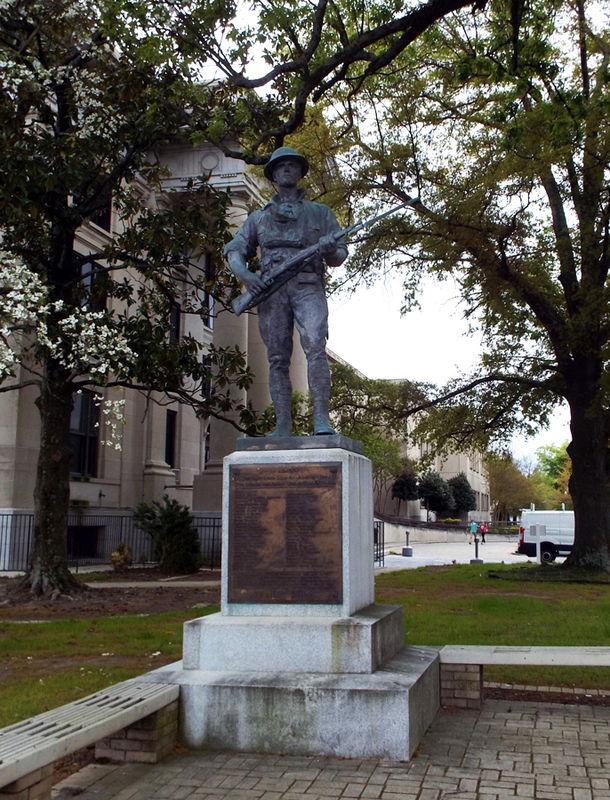 The courthouse grounds also hold Veterans Memorial, a plaque commemorating General Lee's surrender at Appomattox, a memorial listing Johnston County war dead since World War Two, a memorial flagpole to World War Two and Korean War dead, and World War One Memorial Drinking Fountain. The statue stands on the front lawn under shady mature trees.